Have you ever read a book that has moved you so much and means more than you can pen into words? 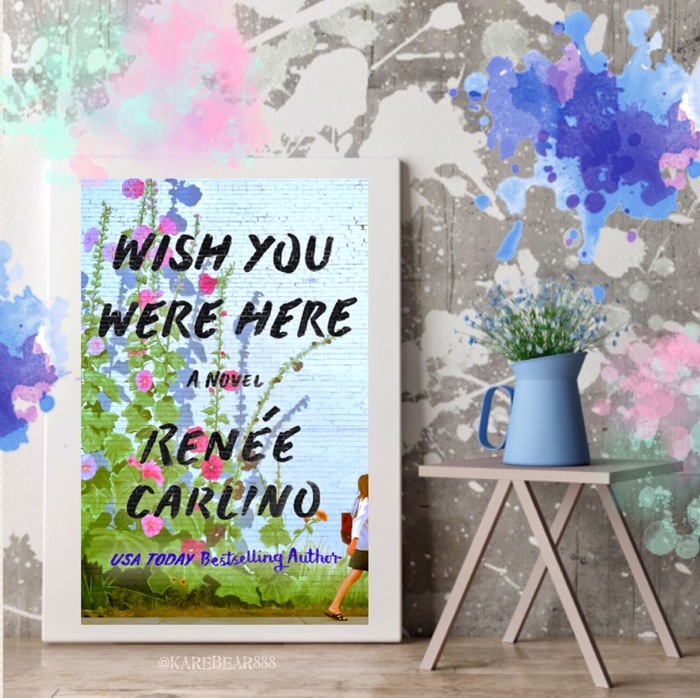 I’m still MESMERIZED—so UNEQUIVOCALLY MOVED—by Renee Carlino’s words in Wish You Were Here, a story that STUNNED ME SPEECHLESS. A story that made me melt…made me break…made me think…made me feel. Wish You Were Here made my HEART BLEED and my SOUL SOAR, and I can’t stop feeling this romance. I knew right away that this story was SPECIAL. I knew that Wish You Were Here is the kind of story that sticks, the soul-stirring type that stays long after the last page is turned. I knew this tale would hold my heart in its hands forever, and I would let it take my heart as its own because Wish You Were Here OWNED ME and MY HEART FROM THE START. This is a romance you have to experience and wholeheartedly feel for yourself—preferably blindly—as I did. Wish You Were Here is not a story but an adventure, a romance that is so much more: love but mostly life. This story, along with its hero and heroine, is strength in spades. Wish You Were Here is a journey of love and life; happiness and heartbreak; and so much strength. It was like we already knew each other, like we had met in a previous life. After a magical night together, Charlotte and Adam felt the force of fate, as if they were soul mates. I MELTED from the MAGIC of this couple. I felt their SPARK too. Together, this hero and heroine were the sun amid the storm. I lost myself in Wish You Were Here, vanishing into this life-altering story, SPELLBOUND, as it seized every part of me: body, heart, and soul. Wish You Were Here is HEARTBREAKINGLY BEAUTIFUL, a book bleeding with feels. Oh did my heart break, shattering into pieces!!! Tears flowed like a river and I didn’t try to stop them…could not stop them. I UGLY CRIED, and it was catastrophic yet cathartic. The feels flowed feverishly where I FELT EVERY WORD ON EVERY PAGE. I felt every drop of sunlight, every drop of rain, every pull of my heart, and every slay of my soul. I FELT EVERYTHING!!! The first thing I noticed about this story besides its stunning cover is that Renee Carlino weaves her work with detail, incredible descriptors that transport you right into the story. I was immediately thrust into the world of Wish You Were Here. This is my first Renee Carlino romance but I can feel how this incredible and new favorite author of mine poured her heart, blood, sweat, and tears into a breathtakingly beautiful and brilliant book. This PERFECTLY POIGNANT LOVE STORY is one that remains for a lifetime like that epic love we all seek. Wish You Were Here is a story that is SO MUCH MORE than a romance. Wish You Were Here is taking that leap and living life to the fullest. Wish You Were Here is love against the odds. 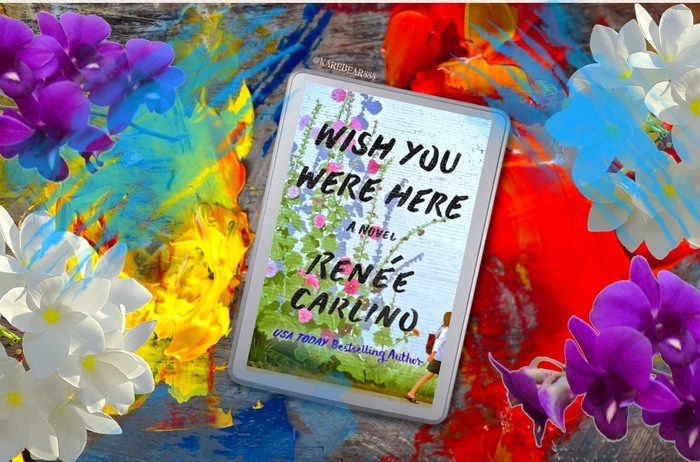 Wish You Were Here is happiness, hope, and heartbreak in a book bathed in beautiful words. Devastatingly beautiful, passionately poignant, and life-changing, Wish You Were Here is a book that bleeds LOVE and LIFE. You can’t help but become touched by this love story and FEEL Wish You Were Here word-for-word and cover-to-cover.I’m still being touched by this romance. Tears are etched in my eyes, ones that still feel fresh from feeling so much. My HEART IS WIDE OPEN as it sits—SHATTERED yet SOARING—from this soul-searing story. Wish You Were Here is a romance I wish everyone would read. I’ll forever feel this masterpiece in vibrant color. A TOP 2017 MUST-READ ROMANCE!!! Stalk Renee Carlino at these sites!